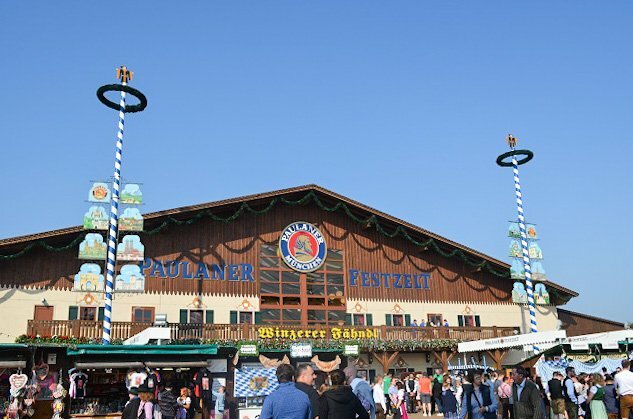 Given its popularity, most people advise planning a trip to attend Oktoberfest in Munich well in advance. And while I’m not exactly against that advice, I think it’s also possible to put together a successful trip at the last minute. Unless you live somewhere in Europe, you’ll probably fly in for the festivities. The rising cost of airfare as the fest approaches is one of the main reasons why you’d want to book early. But if you don’t, the best way to mitigate the cost is to be flexible. Sure, you may want to catch the tapping of the first keg or enjoy it on a weekend, but it’s going to be much cheaper to fly on on a Tuesday than it is on a Friday. Another important factor to consider is geography. You don’t need to fly directly into Munich, you just have to get somewhere in the vicinity. So check around. It may save you hundreds of dollars to fly into a destination that is not in demand. Popular nearby airports include Dusseldorf, Frankfurt, even Vienna. You can use sites like Kiwi that allow you to search for flights to a radius of any size around a city. Then you just need to find transportation to Munich, which will be a fraction of the cost of a direct flight there. As a general rule, buses will be cheaper than trains, and ride shares will be cheaper than buses. Using GoEuro, you can compare prices for all these options including ride shares offered on sites like BlaBlaCar. If you’re already in Europe, then you’re guaranteed to find some affordable way to get to Munich, even at the last minute. You can also rent a car or ride with a friend that has one, which is what I did. This is where they kill you. If you’re planning a last minute trip to Munich, you’ll notice that whatever hotels are still available during Oktoberfest are somewhere in the $300-600 a night range. Some of the only options that are even close to being reasonable (read: less than $300 a night) are up to 20 or 30 miles outside of Munich. Hostels are just as grim. You’ll find beds in dorms for upwards of $100 a night per person, which defeats the purpose of staying in a hostel. For that, you can just split the cost of a hotel room. But AirBnB saves the day. Because no matter how much you waited to book your trip, there are locals who waited just as long to list their places. And though some people are still charging a ridiculous amount of money, there are others who have obviously never rented their place that are just looking to make a little extra cash. We were lucky to find one of those people, and though she forgot to give us the house number or the name of the WiFi network, we were able to stay in an awesome private apartment walking distance from Oktoberfest for less than $200 a night. Of course, whether you’re staying a hotel, a hostel, or renting a room on AirBnB, you’ll get the cheapest prices in the middle of the week. 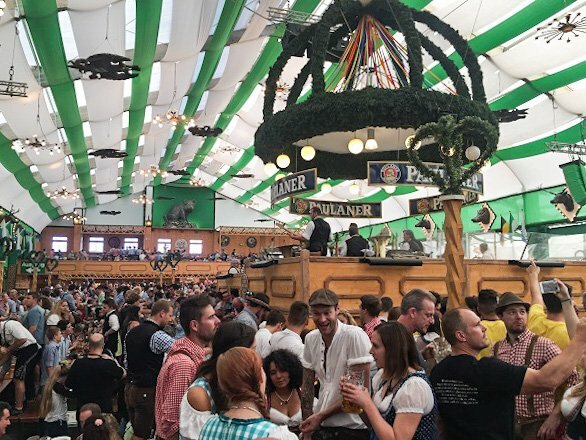 Obviously, the best way to enjoy Oktoberfest is to reserve a table for you and your friends during peak time at some of the most sought after tents like the Hofbrau and Hacker tents. But if you’re booking a place to sleep three days before you arrive in Munich, you have a snowflake’s chance in hell at getting a table reservation. That’s not to say you can’t try. To make reservations, you’ll need to contact the individual tent and request a spot. But tents start booking up sometime in March or April, so you’ll probably be wasting your time. If you’re winging it at the last minute, you’ll need to start drinking by 9 or 10 am to get a seat anywhere on the weekend. If you go during the week, you will have better luck as the festival is less packed until the afternoon. The earlier in the day you go, the more flexibility you’ll have getting around. Even if you can’t get a seat, you’ll be able to at least peek inside most tents. If you show up in the afternoon, there’s a good chance they’ll be at capacity and the doors will be closed. So don’t be discouraged by your own poor planning. 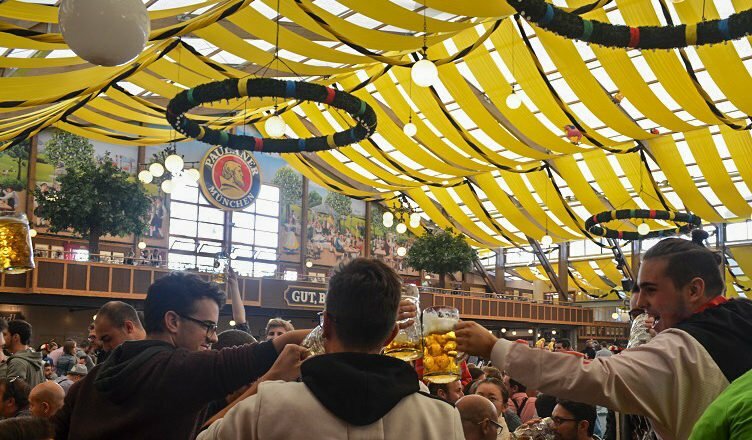 You can enjoy Oktoberfest in Munich at the last minute, and don’t let anyone tell you otherwise.